Riverside Educare is a purpose built, fully licensed and chartered early childcare centre located in Riverside Park. The focus is on quality education and care, with low teacher-child ratios, facilitated by qualified and registered early childhood teachers. It is licensed to operate between 7:30am and 6pm and offers both sessional and full day services for infants from 12 weeks of age up to children ready for school. It is open Monday to Friday, all year round excluding a short break between Christmas and New Year. The centre has three separate areas for infants, toddlers and pre-schoolers and offers competitive rates, WINZ subsidies and 20 hours ECE education for 3-5 year olds. The centre offers cooked hot meals (morning tea, lunch and afternoon tea) for the children for a small additional fee. The large, spacious grounds feature open spaces for running and energetic play, an all-weather track perfect for riding bikes as well as a ‘mountain’ ideal for numerous activities including snow fun in the winter. 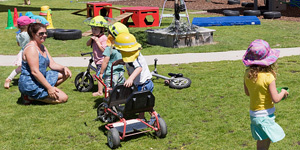 The playground equipment is movable so new and exciting challenges are offered regularly. The outdoor area is designed to physically challenge children as well as to inspire their imagination, exploration and creativity.